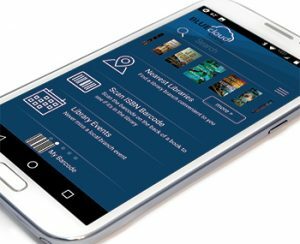 As of March 26, 2019 the existing Atlantic County Library System mobile app is no longer be available. However, because we understand the value and ease of a mobile friendly app, we are in the process of creating a more interactive one for our patrons. The changeover will take some time but the goal is to launch the new app by summer. In the meantime, you can always search our catalog or log into your account from your PC or mobile device's browser to place holds and renew items. We understand and apologize for the inconvenience this will cause those of you who have become so dependent on ACLS’s app. 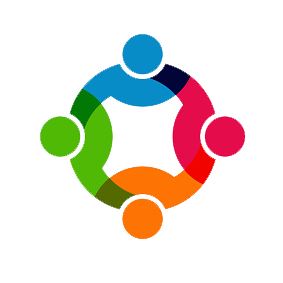 However, the ultimate objective is to enrich your user experience and we know this change will do that. Egg Harbor City may be the smallest branch in the Atlantic County Library System but we have a big heart for our community and our local talent. Currently, we are honored to showcase the beautiful and unique art work of Tom Peterson and Ann Fox. Both are long time patrons and Egg Harbor City residents who have generously donated pieces for exhibit. Service station owner Tom Peterson imaginatively uses car parts and scrap metal as well as everyday metal objects for his sculptures. 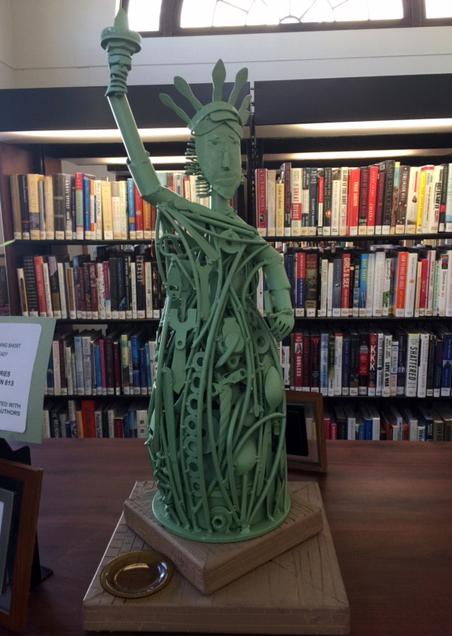 Tom’s Lady Liberty is fashioned with forks, nuts, bolts, washers, screws and even a rivet from the Ben Franklin Bridge. 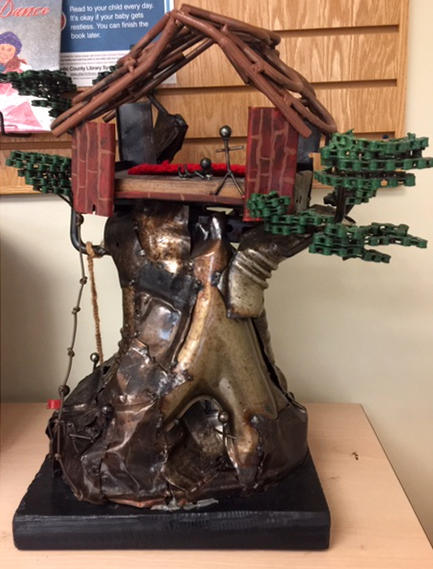 For Magic Tree House, car exhaust shields, bicycle chains, muffler clamps, and other scrap metals come together to create magical quality. When not focused on her art, Ann Fox enjoys sewing, baking (often treating the Egg Harbor City book club), and walking around her working Cranberry Farm. 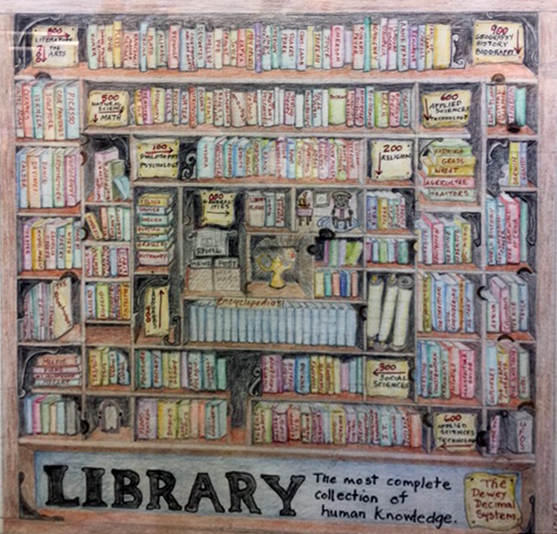 Ann's pencil drawing illustrates her appreciation for detail as well as libraries and the pursuit of knowledge through reading. We invite you to come by to peruse their art and our shelves. Whether it be contemporary, historical, time travel, paranormal or inspirational, people love to read about love. 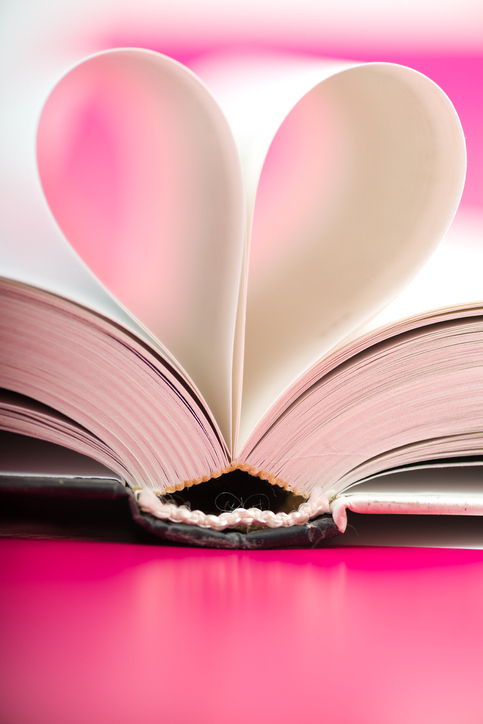 For your romantic fix, the Atlantic County Library System provides unlimited and unrestricted access to downloadable romance novels through RomanceBookCloud. With a core collection of 1800 titles, including award winners and best sellers, plus new books added all the time, you will never run out of romance to read this Valentine's Day or all year long! Federal workers, families and businesses across Atlantic County have been financially and emotionally affected by the Government shutdown. As a consequence, many local business, utility companies, large corporations as well as charity organizations are doing what they can to ease the burden and stress that has been caused. While we are happy a temporary agreement has been reached to reopen Federal services, assistance may still be needed until folks can get themselves back on their feet. To this end, the Atlantic County Library System will continue waiving library fines for Federal employees and contractors until at least February 15, 2019. Those affected can show their employee IDs at their local branch to get a fresh start. We welcome you to check out books, movies, and music as well as use our public computers and other services for some relief during this difficult time. Click here for a list of other types of support that can be found for our community. Stories, songs, snacks and an easy craft. Please advise of any food allergies.